How pretty – the first one is beautiful. Those are great!! I would totally use those. What a great idea. Very cute! Very cute, Katie – the lace finishes the pincushions nicely! wow! Such tiny work……the lacework is lovely! I’m such a troglodyte. I couldn’t figure out the bottle cap part and the pincushion part. Then I reread it and saw that it is a ring……….tooooooooooooooooo cute! Was it really hard to make? They are lovely – beautful intricate work. Val, the pincushion ring was really easy to make. You basically take a 4.25″ circle of fabric and take it up like a yo-yo. Add polyfil and close. 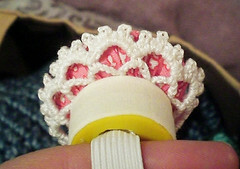 Once you’ve added the elastic (or whatever you want to use for the ring), all you have to do is glue the pincushion and lace inside the bottle cap. 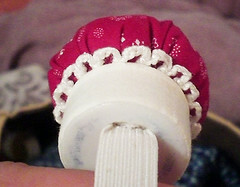 I also covered the bottle cap with a strip of fabric using glue. I didn’t worry about the bottom of the cap since it is against the finger and no one will see it. The hardest part, in my opinion, was cutting the holes in the cap for the elastic.